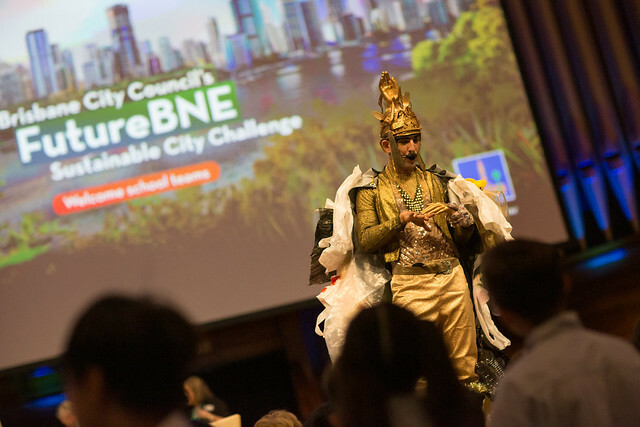 As part of World Science Festival Brisbane, Brisbane City Council hosted the Green Heart Schools Future BNE Challenge - an interactive, innovation-focused event imagining Brisbane as a city of the future. As part of this event, school teams evaluated local and global challenges faced by cities and recorded a video pitch about their solution to make Brisbane the cleanest, greenest, most sustainable city in Australia. The Future BNE Challenge is designed for Year 7 students and is linked to the Australian Curriculum and Science, Technology, Engineering and Mathematics (STEM) education. It was held at Brisbane City Hall on Wednesday 20 March 2019. Read the 2019 Future BNE Challenge terms and conditions for more information about this year's categories and prizes. View photos from the Green Heart Schools Future BNE Challenge 2019 in the slideshow below. Alternatively, view the slideshow in Council's Flickr account. Read about the 2018 Future BNE Challenge. This page also includes photos and video from 2018 and a link to photos in a Flickr gallery from 2017.
visit the World Science Festival Brisbane website.